eNETPayroll offers simple, effective payroll management through a secure, cloud based application. It's suitable for businesses of all sizes and has been used by thousands of businesses across Canada since 1997. With program functions that can be customized to your unique situation, it's the perfect solution for companies that require flexibility for thier payroll needs. Convenient, Cost Effective and Reliable - Imagine the convenience of calculating your payroll at a time that's convenient to you. If you have an internet browser, you're ready to work online with the program - it's that simple. And if you’re currently outsourcing your payroll, eNETPayroll will perform all the same functions at a fraction of the cost. And with no more software backups and updates to perform, you can be assured that the program is at the ready when you are. 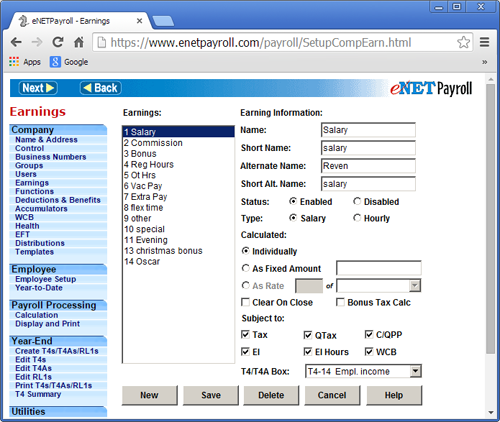 eNETPayroll supports all payroll scenarios with unlimited earnings, deductions, benefits and accumulators. Use the program to manage all aspects of your company's payroll process including salaries, wages, bonuses, and deductions. Whether simple or complex, eNETPayroll will make the employee payment process faster and more effective. The program includes a built-in reporting system that allows you to control how your data is presented. 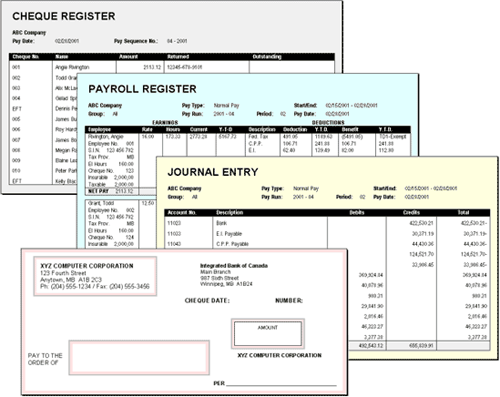 For example, sort Cheques Registers by Sequence Number, Cheque Number or Distribution. Display options include EFT, Void Cheques, Cheques Issued and more. Use the Journal Entry report to review all the general ledger transactions for each payroll run. Use the program's powerful Export feature to generate files that can interface with your existing tools. Export the Journal Entry Report for use with accounting packages, T4 Web files for electronic submission of year end information, Record of Employment data for uploading directly to ROE Web, and more. eNETPayroll's basic pricing includes all of the features you need to pay your employees, including EFT. Everything from unlimited employees, interim payroll processing, extra or additional payroll runs, printed cheque or e-mail pay statements, customized reporting are included. Government and third-party remittances, ROE's and T4's are also available as add-ons* so that you pay only for the level of service you require*. Read below to see the list of features included FREE with your service fee. Multiple business number accounts with varying E.I. rates. Unlimited fully user defined earnings, deductions, benefits and accumulators. User customizable functions for calculations of benefits and accumulators. Employee templates make adding employees a breeze. Print cheques, statements and any reports directly to your local printer. Export T4 web files for electronic submission of year end information. Export of Record of Employment data for uploading directly to ROE Web. Employee login access to secure area allowing employees to view their pay history and change address and banking information. Email pay statements directly to employees inbox. Extensive distribution breakdown to match existing accounting practices. Easily create additional and extra pay runs for omissions or early payment requests. Export your journal entry or all data for third party reporting. Print pay statements and T4 reports to self sealing forms. Direct deposit up to 3 different bank accounts per employee. Extensive data visibility through profile reporting and data export capabilities. Choose one of the buttons above or call 1-800-665-5129 to get started with eNETPayroll today!